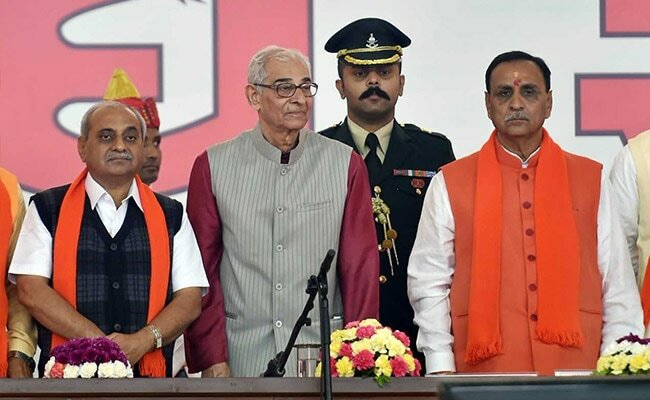 A crisis was averted in the newly-formed Gujarat government today, with BJP chief Amit Shah stepping in to address the grievances of Nitin Patel, the deputy of Chief Minister Vijay Rupani. Mr Patel had been deeply unhappy with the portfolios he was given and Hardik Patel had been sending feelers to him. The 24-year-old Patidar leader had suggested that the Deputy Chief Minister would be given departments of his choice if he quit the BJP with 10 legislators and joined the Congress, which is 12 seats short of majority in the 182-member state assembly. Nitin Patel today said he had dialed the senior leadership. "I had conveyed to party high command to either give me respectable departments or relive me from Cabinet," he was quoted as saying by news agency Press Trust of India. But he said he would take charge of his departments today, since Amit Shah had called him and asked him to do so. By the afternoon, he was allocated the finance portfolio - one of the departments he handled before the recent assembly elections. After the elections, Mr Rupani handed the finance portfolio to Saurabh Patel and kept urban development - the other department Nitin Patel handled - with himself. Nitin Patel was given road and building, health, medical education, Narmada, Kalpsar and capital projects - a move, which Mr Rupani said, did not indicate any disrespect to the 61-year-old minister. "It is not true that the minister who has the finance portfolio, is the number two in the cabinet. Nitin Patel is our senior leader and will remain the number two," the Chief Minister had said. But his remark had failed to reassure Mr Patel. Nitin Patel, a seven-time legislator, was upgraded to the Deputy Chief Minister's post in 2016, when Anandiben Patel stepped down as the Chief Minister following the huge quota stir spear-headed by Hardik Patel. His upgrade was meant to signal that the Patel community would continue to get a good deal from the BJP. Yesterday, Hardik Patel, who had sided with the Congress, said Nitin Patel could get a good deal from the opposition party, which won 80 of the state's 182 seats in the recent assembly elections. The BJP won 99 seats. "If Gujarat Deputy CM Nitin Patel along with 10 MLAs is ready to leave BJP, then I will talk to Congress to get him a good position," Hardik Patel said. While a local leader of the Congress, Virji Thummar, said Nitin Patel would be made the Chief Minister if he joined, the party distanced itself from his remarks, describing the row over the portfolio distribution as the BJP's "internal matter".